Please talk me off the ledge that my progesterone has dropped from 38 to 28 and my hcg numbers are slowing down? Pregnancy is hard work, man. This entry was posted on 18:03 and is filed under #MicroblogMondays , Pregnancy . You can follow any responses to this entry through the RSS 2.0 feed. You can leave a response, or trackback from your own site. "In most normal pregnancies at hCG levels below 1,200 mIU/ml the hCG usually doubles every 48-72 hours. At levels below 6,000 mIU/ml the hCG levels normally increase by at least 60% every 2-3 days, though increases between 50-60% can sometimes still be seen in normal pregnancies. " 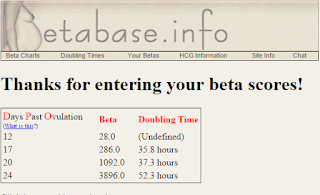 Beta hCG levels usually double about every 2 days for the first four weeks of pregnancy. As pregnancy progresses the doubling time becomes longer. 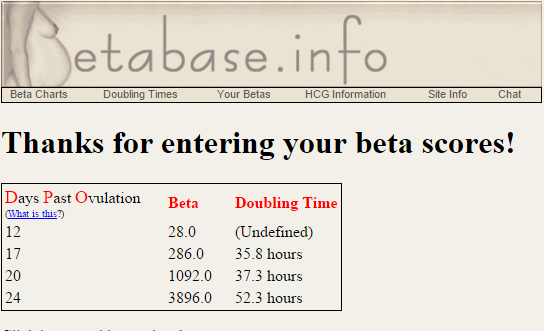 By 6 to 7 weeks beta hCG levels may take as long as 3 1/2 days to double . hCG normally reaches a peak level at about 8 to 10 weeks and then declines for the remainder of the pregnancy. In addition to the general info Kate posted above, here's a study showing that hcg plateaus earlier in IVF pregnancies, consistently with where you are in yours. Notably: "he quadratic curve described by these data indicates that the rate of increase slows at ∼24 days post-oocyte retrieval, corresponding to a gestational age of 38 days (5 weeks and 3 days) and an approximate HCG concentration of 3000 mIU/ml. This relatively early plateau in HCG production may reflect differential rates of implantation and resorption of non-viable embryos in pregnancies resulting from IVF. Alternatively, it is possible that the administration of exogenous progesterone, which is common practice in IVF treatment, leads to a diminished need for the HCG-induced steroidogenesis of the corpora lutea (Kohen et al., 2003)." My doc says as long as progesterone is over 15 (indicating "high enough") they don't care what the number is and it can fluctuate as much as it wants (time of day, how much you've eaten, etc. can apparently affect it). I know nothing about progesterone - my doctor only ever tested my HCG (and only twice at 9DP6DT and 11DP5DT) so that's all I know to go by. Your numbers look great, I had a doubling rate of 48 hours. I know it's hard not to scrutinize everything. I've been following since before your baby girl and I just want to let you know you have a lot of support here. I am keeping positive for you!! My doubling time started out around 50 hours. And I was pregnant with twins! Your numbers look terrific. You said it perfectly. Pregnancy is hard work. It feels like there is never a moment to relax or just enjoy it. Sending deep breaths. Hope all is fine. Your numbers actually look very good.